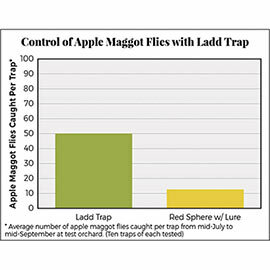 Give apple maggots the one-two punch with our Ladd Apple Maggot Fly Trap & Lure! Hang the trap with lure early in the season to attract the adult flies. This unique trap combines a traditional red sphere with a yellow, rectangular (8" x 11") trap to provide a much larger surface area for the catch. In garden trials, it caught more than four times as many adult maggot flies on average as typical red sticky spheres baited with a lure. 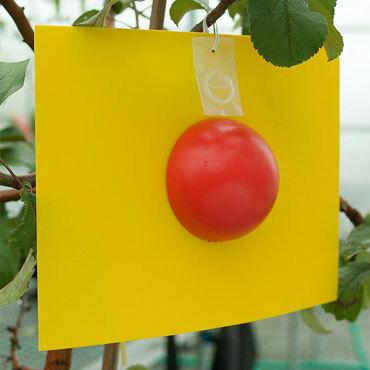 To use, coat both the red sphere and yellow rectangle with Tangle-Trap® Sticky Coating (sold separately), then apply the lure to the sticky yellow surface. After petal fall, hang one trap with lure on each dwarf or semi-dwarf apple, pear or plum tree; six traps with lures on each standard tree. Replace lures every 3-4 weeks. Traps can be washed and recoated for re-use year after year.